Join the Conversation on Twitter: Tweet using the hashtag #NYNDM and follow @ICSC for the latest news and updates on the event. industry stakeholders – an impressive 25% growth in attendance. making this the must-attend event for deal making and networking. Network and conduct business at the Deal Making taking place Monday, December 7 and Tuesday, December 8 from 9:00 am – 5:00 pm. Cities of the World Pavilion showcases cities and municipalities looking to attract retail and real estate development to their communities. The Pavillion will allow attendees to learn about incentives, inducements and development opportunities. Meet who’s who in finance and retail development at the Finance Pavilion. This is one convenient stop for attendees to meet with banks and other financial institutions and advisors. Stop by Retailer Row where owners, developers and brokers can meet retailers in a specially designated area in the trade show. Retail is becoming global and we are seeing more retailers and developers crossing borders. The International Pavilion will allow attendees to learn about opportunities in different areas of the world. shuttle bus service will be provided once again from official hotels. You’re making an important decision – to join the International Council of Shopping Centers – the premier voice of the global retail real estate community. ICSC is a company-based membership association. Your company/organization must be an ICSC member before you can join as an individual. Is your company already an ICSC member? Start the join/rejoin process by confirming your company’s membership status. 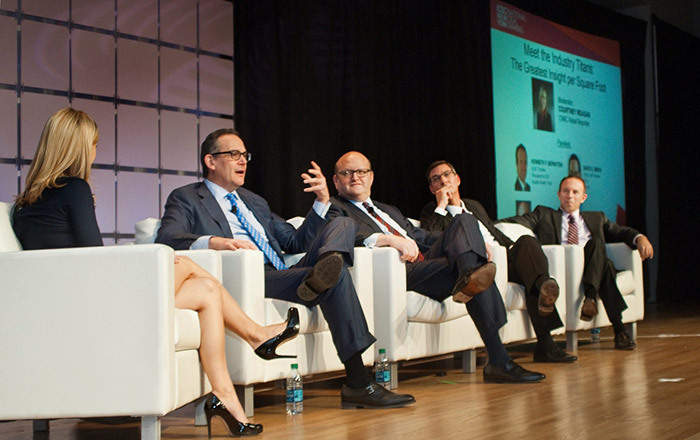 NEW YORK, December 11, 2014 – The International Council of Shopping Centers’ (ICSC) decision to move the New York National Deal Making Conference to the Javits Convention Center was a huge success. The two-day event at the new location nearly doubled the size of the space, and with more than 400 exhibiting companies and an impressive 9,600 attendees, the results were a record attendance and a 26% increase compared to the 2013 event. Attendees expressed their optimism and excitement about the industry as they participated in conference events, including panel discussions and an opening keynote speech by Donald Trump, chairman and president of The Trump Organization. “The fundamentals of the business are incredibly sound,” said Daniel Hurwitz, CEO of DDR. Hurwitz was joined in a panel discussion on day one of the conference by Kenneth Bernstein, president and CEO of Acadia Realty Trust, David Simon, chairman and CEO of Simon, and Don Wood, president and CEO of Federal Realty Investment Trust. The exhibition floor was home to hundreds of owners, developers, retailers and many more who were there with the same goal in mind – to showcase their newest projects and iconic retail spaces, and to explore opportunities and partnerships. During the conference, the ICSC Foundation also announced the launch of the Edward J. DeBartolo, Sr. Scholarship, in honor of the mall pioneer, seeded by a $500,000 donation from the DeBartolo families, the DeBartolo Corp. and DeBartolo Holdings. The scholarship will go to a graduate student of real estate, retail or a related field. Founded in 1957, ICSC is the premier global trade association of the shopping center industry. Its more than 67,000 members in over 100 countries include shopping center owners, developers, managers, marketing specialists, investors, retailers and brokers, as well as academics and public officials. For more information, visit www.icsc.org.